in the nation’s number 1 city for sports! Over the past 34 years, swimmers and divers from across the nation have made history at the IU Natatorium at IUPUI. Two hundred and forty-two athletes have qualified for the Olympics here, and eighteen world records have been broken. 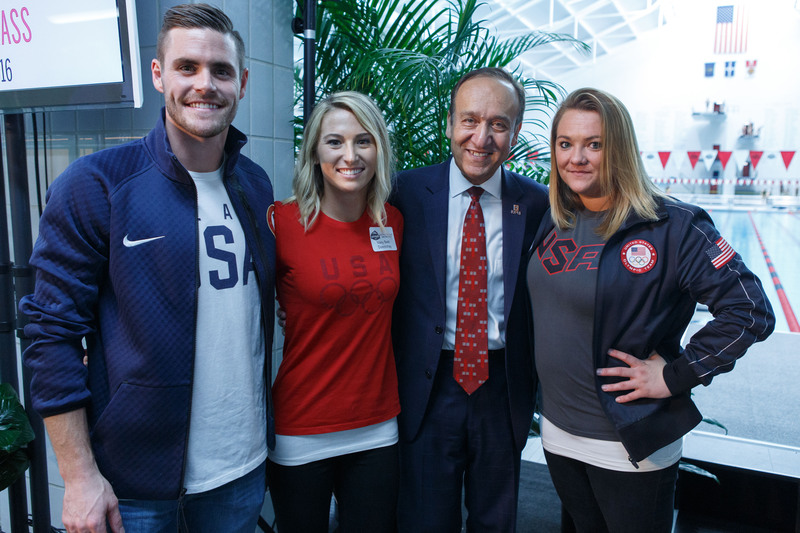 In fact, I am delighted that Olympians David Boudia, Kelci Bryant, and Mary Beth Dunnichay are with us this afternoon. They are inspirations and have helped write the latest chapters in American aquatics history. Part of that history has been written on the wall of the Natatorium. You can read the name of every athlete who has qualified for the Olympics at the Natatorium there on the wall behind the diving well. As we look toward the next thirty years, we may need more real estate as we continue to expand on that impressive history. The Natatorium is the latest example of how IUPUI and this city are working together to provide incomparable resources to the people of Indiana. The Natatorium is also part of the fabric of this community. Some people look around here and see a swimming pool, diving boards and platforms. Others come here and see their family history in these waters. I could mention so many different families, but I am delighted that members of the Horlander family are with us this afternoon to celebrate. They have supported the Natatorium with their gifts, their service, and their competitive presence for many years, with members of the family learning to swim here, breaking high school records, and competing in the NCAA Championships, among so many other memories. They exemplify the power of place—this magnificent place—in creating a legacy of achievement and family tradition that will last a lifetime. As a resource for all ages—from water babies to seniors—the Nat also exemplifies our campus’ deep commitment to and investment in Hoosier health and wellness. Over 200,000 people from the community and beyond visit the Nat every year for competition, swim lessons, swim and dive clubs, aqua fitness classes, team practices and camps. In fact, I remember when my own sons attended swim camps here when they were young. They didn’t become Michael Phelps, but they can hold their own in the water thanks to the Nat and its outstanding staff. And the Natatorium has made a difference in the life of the IUPUI campus. It draws hundreds of thousands of people who otherwise might not visit our campus. They get to know IUPUI through the Natatorium. And with more students living on campus, the Natatorium offers another way to enrich for student life on campus, building traditions that not only promote health but also reinforce student success. In one way or another, the Natatorium hits all three of our strategic goals, which focus on student success, health and life sciences, and the well-being of the citizens of Indianapolis, Indiana, and beyond. That’s quite a bit of bang for our buck. Speaking of that value, I would like to join President McRobbie in thanking those who have contributed so much to this project. On behalf of the IUPUI campus, it is my honor to thank Mayor Hogsett and the city of Indianapolis for their investment in this project and for their years of partnership. The Natatorium is the latest example of how IUPUI and this city are working together to provide incomparable resources to the people of Indiana. Let me also add my thanks on behalf of the campus to Lilly Endowment for all that you do for the community and for IUPUI in particular. It is impossible to calculate the number of lives you have transformed through your remarkable generosity. Because of your support, the IU Natatorium will remain a valuable asset to the community as a world-class aquatic destination. Thanks to you, children who train and compete here will continue to dream about being Olympians like David, Kelcie, and Mary Beth. Finally, I would also like to thank the many people whose hard work we are celebrating today. 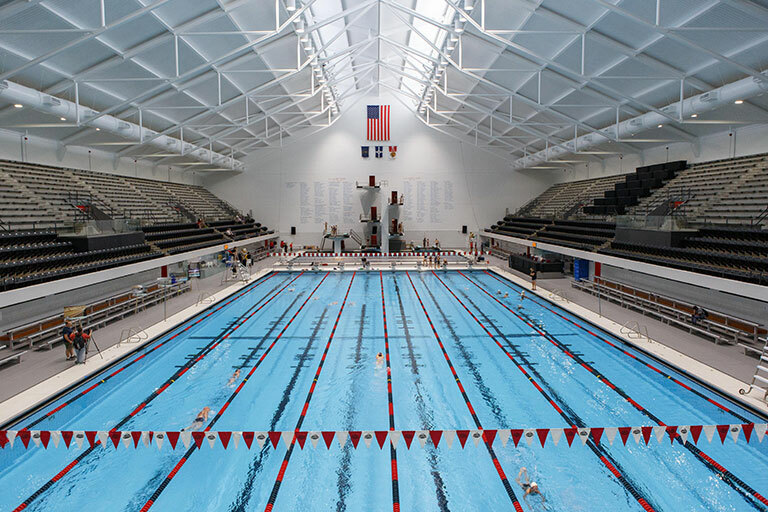 Among many other projects, they fixed the roof, replaced important systems, and installed new starting blocks, doors, windows, and drywall as well as 1.9 million pieces of new deck tiles, and all of this will make the Natatorium continue to stand among the best aquatic facilities in the nation. Please join me in thanking everyone who has made all of this possible.